Long time no blog! I'm back after a somewhat short hiatus from blogging. I hope you all had a wonderful New Year's and CNY! 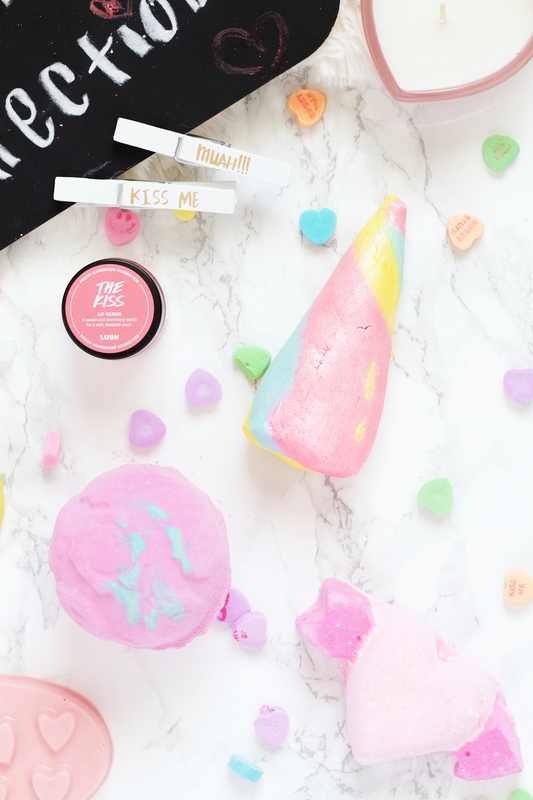 I'm breaking into 2017 with a new post all about Lush's Valentine's Day Collection. I was kindly sent some pieces from their new collection for reviewing purposes and I've been loving every single thing. 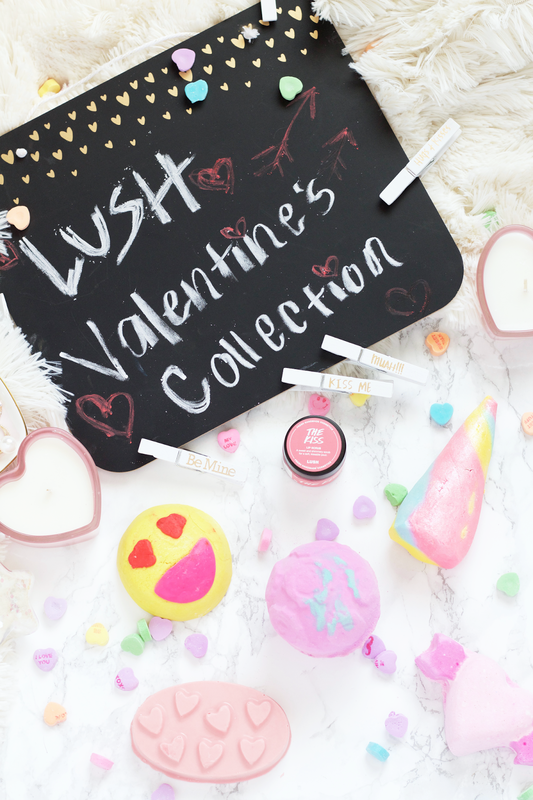 This Valentine's Day Collection has some AMAZING limited edition items, some new and some re-promotes. Either way, you definitely will be needing to run to your nearest Lush to grab at least one or two things before this collection phases out. 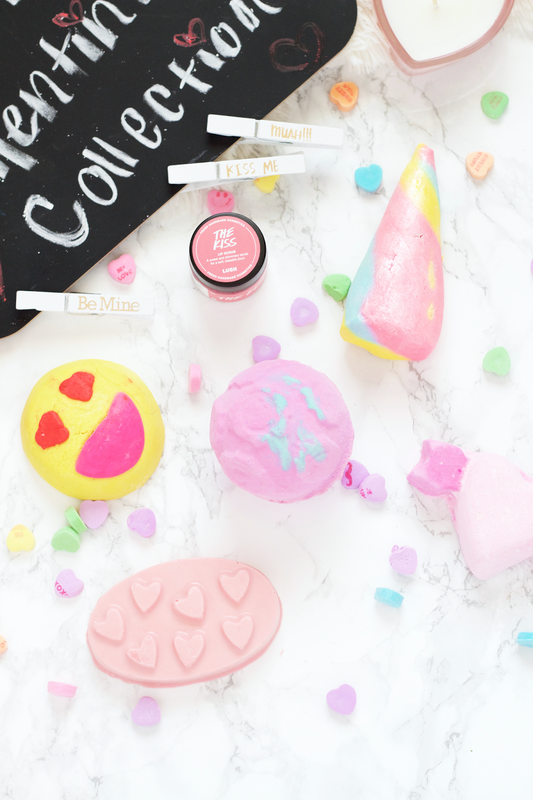 Included in this Valentine's Day Collection is a variety of the usual gift sets, bath bombs, bubble bars, special lip scrub and accompanying lip gloss, soap, and also a bath melt. Lush isn't stopping short of creating the perfect atmosphere for those celebrating and wanting to pamper themselves and their loved ones. Of course, whether or not you celebrate Valentine's Day (or Galentine's Day! ), these products are wonderful for some self care time. What really has impressed me with this collection is the attention put towards creating high quality themed products, from Cupid Bath Bomb being shaped as a bow-and-arrow heart to Rose Bombshell Bath Bomb having raised rose imagery on top and the most luscious rose fragrance. Every product is given a lot of thought. I especially love the variation with the gift sets, Lots of Love, Happy Valentine's Day, and Love and Kisses are top notch. It's hard to praise this collection without talking about the selection of fragrances and mixtures, and they themselves are wonderfully put together. I thought that the Holiday 2016 selection smelled amazing but this takes the cake and more. Even as I sit writing this the scents from these products are taking me to heaven. If you read my Lush Holiday 2016 post, then you would know that I just recently tried out their flavored Lip Sugar Scrubs. I fell in love with Sugar Plum Fairy and was so excited to see another one included with my package to review. 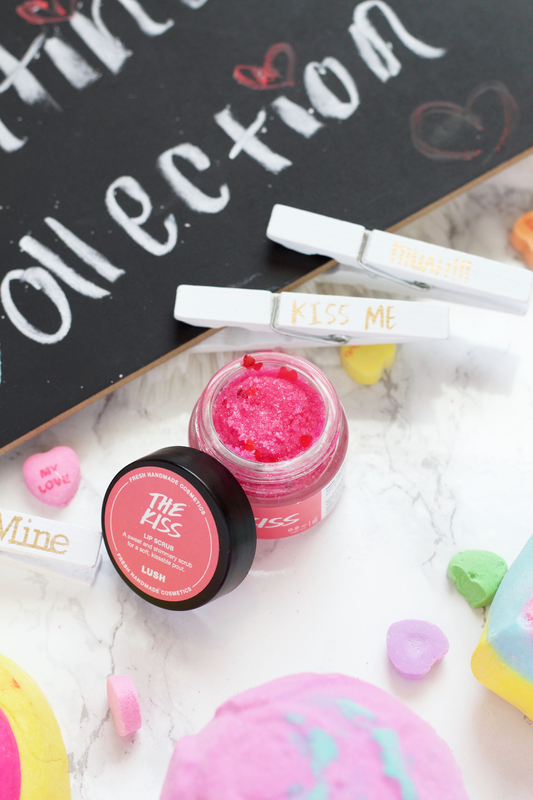 The Kiss Lip Scrub* ($9.95) is a hot pink, bubble gum scented scrub that is super sweet to the taste buds. It is limited edition and a debut to this collection, featuring ingredients such as Sicilian Mandarin oil, Organic Cocoa Butter, and Safflower Oil. This really gets the job done for being a Lip Scrub and makes my lips super smooth afterwards. Whether I apply a lip balm or lip oil afterwards, they both easily glide right on and any lip product I use has no issues. What makes this Lip Scrub so unique is not only the sweet scent (that I'm addicted to!) but also the inclusion of the little hearts! They can be a little abrasive so you'll need to be careful but I love that addition to the product. I wasn't joking when I said that there is a lot of attention put to detail with the products in this collection! This also tends to tint your lips a lovely darker pink color, which works really well if you decide to purchase the accompanying lip gloss too since it's also a similar shade from what I can tell. If I had to choose between Sugar Plum Fairy and The Kiss, I actually think I might choose The Kiss! I'm a sucker for super sweet scents and I'm really loving the cute hearts. While they are really only on the top of the container, it's still a nice touch to the product. Plus, anything pink instantly has my attention. One product I was super excited about to try was Unicorn Horn Bubble Bar* ($7.95), as I've heard a lot about it previously and never got my hands on it myself. It has the prettiest design! A shimmery glitter sheen amidst a swirl of pastel rainbow coloring, this alone really makes it such a unique product and one that stands out. I really like that Unicorn Horn was redesigned last year. The colors look more polished and the shimmer more defined. Besides its pleasant looks, the scent of Unicorn Horn is a lovely mixture of lavender, ylang ylang, and neroli. It is very light and soft, a wonderful uplifting scent that is so relaxing and perfect to relax tension. This is easily broken down into soft pieces and creates lots of big bubbles! I really loved that it also turned the water a darker pink and made my skin feel super moisturized. I've broken it into pieces so I still have a bit left for another night of self care that I plan to do, it's honestly the perfect product to use. I definitely will be stocking up on this before this collection is gone and I recommend you do too! There is a really cool video on Lush's youtube page where they show you how they make the Unicorn Horn Bubble Bar, you can check it out here if you're interested. Cupid Bath Bomb* ($5.25) was a love at first sight. When I took it out of the packaging, I honestly was so in love with it before I even knew anything about it! This is a bow-and-arrow heart shaped bath bomb that is softly raspberry scented, with an ingredient mixture of bergamot oil, rose petal powder, fresh raspberry juice, violet leaf absolute, and Persian lime oil. 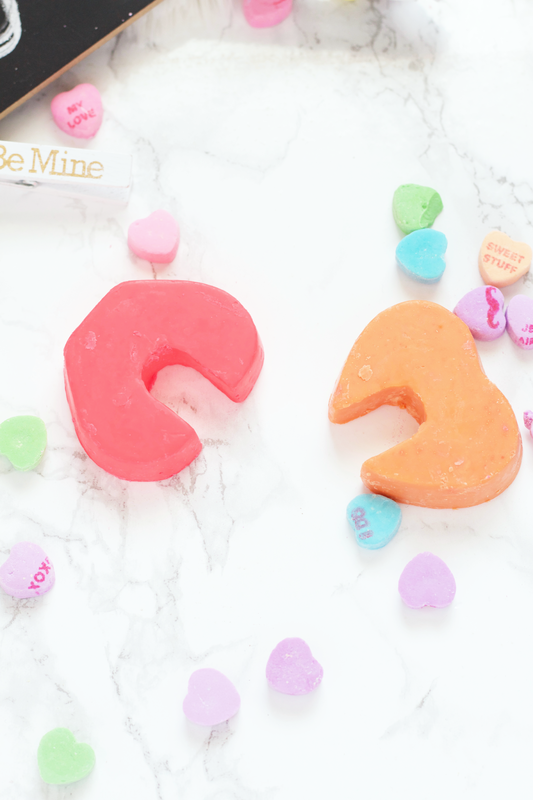 This is one of the best releases that Lush has come out with for their Valentine's Day Collection. Not only for the imagery of the Bath Bomb but the scent, too. The fragrance is soft, sensual, and fruity, almost like a cocktail of romance. Lush also mentions that it shares the same scent with their Razzle Dazzle Luxury Bath Oil. When this is put into the water, it instantly starts to fizz for seconds from either sides until it slowly winds down for the next minutes. I loved the fizzing, I think that was a great aspect about the bath bomb and allowed the product to disperse quickly at first (along with starting to color the water). It looked so beautiful to see the pink and white expand out from each side. The water doesn't fully turn pink in color, rather it is tinted/translucent. The Bath Bomb itself also doesn't fully dissipate either, so you might have a bit of it floating at the surface (which is not a big deal to me, personally!). The best part of it is the scent, which you can really smell once you're in the water and once you get out. I really think this Bath Bomb would be great to use after a date night out when you want to wind down, or even spending a nice time with your SO. It's such a romantic one, I would save it for a special time! Even if you don't have an SO, it's still such a great one to pick up (I know I probably will be!). 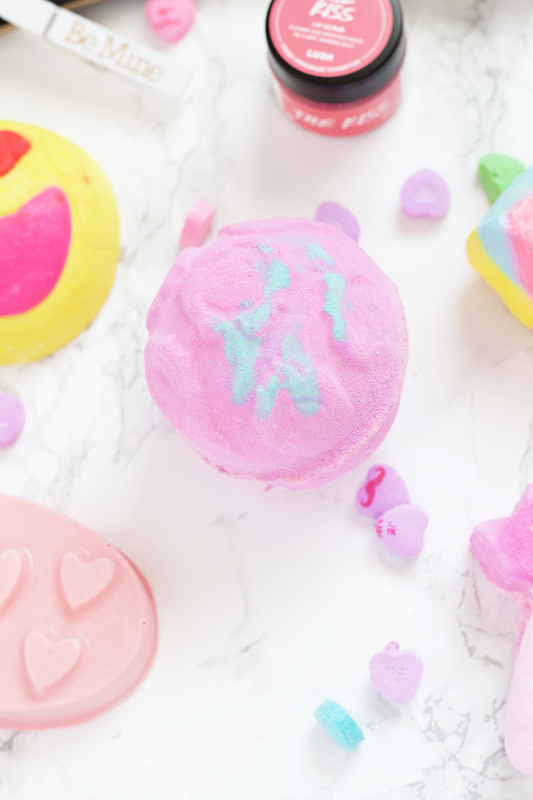 While Lovestruck Bubble Bar* ($8.65) may look a bit Joker-ish at first, don't bypass this one completely just yet! This Bubble Bar may not look beautiful to you but it's what's on the inside that counts, right? Well, that's how I've approached this review. 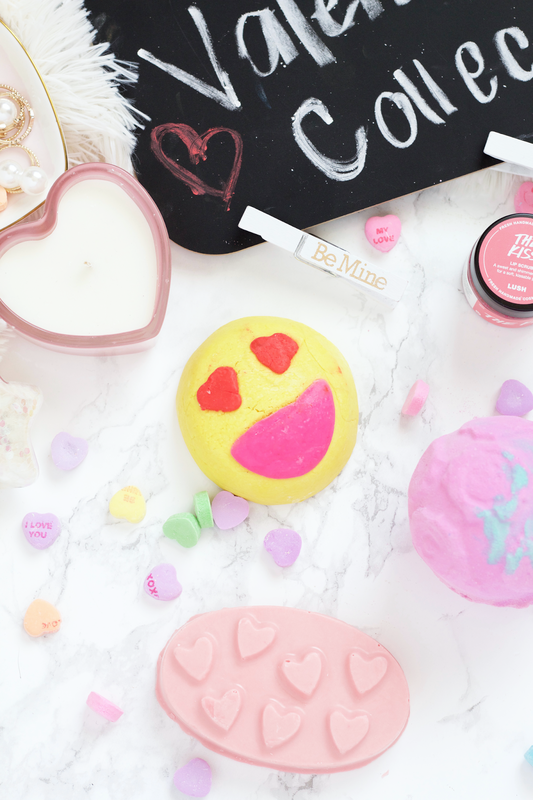 Lovestruck is a smiley emoji Bubble Bar that's scented with Sicilian lemon oil, geranium oil, and petitgrain oil. It's basically a big 'ol fragrance mixture of floral-y, citrus goodness. I really applaud Lush for bringing some humor to their collection, I think this product is a great addition to the rest of their themed pieces. This was really easy to break down under running water and created a lot of fluffy, big bubbles. It turns the tub water a golden yellow color, kind of reminiscent of beer. It is moisturizing but I don't think it's something that I'll pinpoint over others in this collection. I do think this won't be a product everybody will like due to the unique scent, so it might be best if you first go in person and smell it yourself before buying. It's also a bit pricey for a Bubble Bar but considering the size of it, I don't think it's too much of a stretch. Love Spell Massage Bar* ($8.95) is one of the cutest debut products of the collection along with Cupid. The raised hearts on the bar makes it so charming and very in tune with the Valentine's Day theme. The scent of this actually brings a lot of personal memories to me, as it reminds me of my Nonna's old home bathroom soaps. It has the softest mixture of sweet floral and citrus, with organic lemon myrtle oil, neroli oil, rose petal, carnation absolute, and rose hip syrup. The floral adds such a warm uplifting mood while the citrus is very refreshing in contrast. This scent is perfect for this collection, it's quite a muted fragrance that pulls more towards romantic softness. I love being able to apply this straight onto my skin, both raised hearts and flat-side, and allow myself to let the butters and oils do their work. This is one product that can be used multiple amount of times without fuss, as I pleasantly found out that it doesn't easily break down like some bar body products do. Whether you apply this on yourself or your SO, you won't need to worry about going through one of these quickly. It also does a brilliant job at moisturizing your skin and keeping the scent on afterwards. Your skin will feel supple, soft, and very refreshed afterwards. Even for how subtle the scent of the bar is, the fact that it still held on hours afterwards really impressed me. My favorite of the whole collection has got to be Rose Bombshell Bath Bomb* ($7.95). No surprise there! Not only is it a beauty to look at but the scent is sweetly intoxicating. This Bath Bomb has a fragrance cocktail of Sicilian lemon oil, geranium oil, rose absolute, rose oil, and actual rose petals inside of it. This has a strong powdery rose fragrance as well, which makes it extra sweet and uplifting. I love how much this fizzles in the tub, it creates such nice bubbles and turns the water a romantic rose color. There also tends to be white patches swirling at the top of the water throughout the tub, which looked to be a combination of the oils. I also think it's brilliant to have rose petals added into the Bath Bomb, it really creates such a lovely atmosphere and experience with the product. This Bath Bomb was one of the most skin nourishing and moisturizing products out of the whole collection, my skin felt amazing afterwards and the scent still held on for a while. One of the best aspects was that I didn't have to clean up anything afterwards, just another positive about this product. Rose Bombshell will only be around for this collection so I definitely recommend picking up a few! Two Hearts Beating As One* ($10.95) is a very unique inclusion in this collection. It boasts a handful of lush oils, such as apricot kernel oil, argan oil, bergamot oil, geranium oil, jasmine absolute, rose absolute, and ylang ylang oil. This mixture exudes a luscious, sweet floral scent that beckons your senses to stop in its tracks and pay it all of your attention. It is both sensual and flirty, with the floral scent being the showstopper. The jasmine and rose mixture is absolutely breathtaking. You can break them apart to be used at separate times but I really think the best experience you'll have is by using them at the same time. They create the most beautiful mixture of bright red/orange coloring in the bath water and really do look like a heart is beating as they slowly spin in the water. Overall this will take a good 10+ minutes to dissolve, so your best bet would be to actually be in the tub as its happening. You will need to brush your hand through the water a bit to get coloring distributed but it's not much of a hassle. I previously have not been really acquainted with bath melts beyond a few times, but I've found them to be pretty oily for me and I usually don't put my hair in the water when I use them. However, I found that this wasn't that oily and the scent of the bath melt stayed on pretty well afterwards. I think this is a lovely debut product and wonderful to at least try out, but for the price I'm unsure if it's really a need. Overall another amazing collection from Lush! 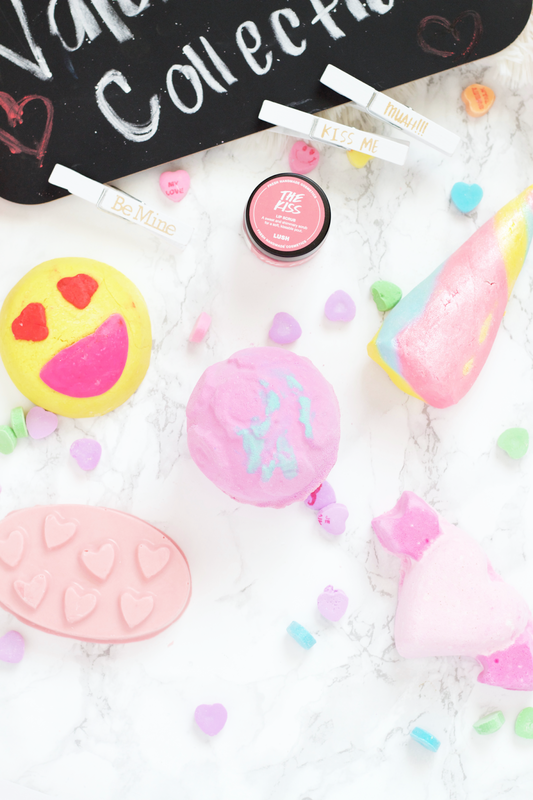 I'm seriously so in love with every product from this Valentine's Day Collection. You can't go wrong with any of these! Will you be picking up any of these products or have you already? Let me know!